Thought I'd start up a thread like have done in the past with any uniform updates/changes for the upcoming season. 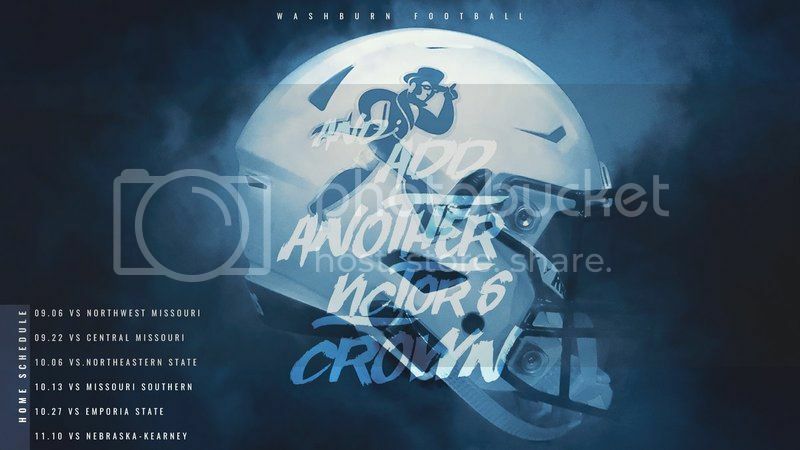 First one I have so far appears to be a new helmet design for Washburn. From the Washburn Football Twitter account. And add another 'Nctor6 ' crown? And add another 'Nector's' crown? And add another 'Motor6' crown? Okay, I know it's Victor's; but who is Victor? why does he need another crown, and I thought it was Ichabod Washburn's university, was his nickname Victor? I thought he wore a top hat, not a crown. and why is vicTo underlined? Sorry, but that helmet is awful. That logo isn't the best thing in the world, but it's light years better than the bland 'W' with 'Washburn' running across it. That is a weak emblem. imo. I think NW should sport Red helmets for Family day this year to honor Coach Bostwick rather than just red Bearcat Paw stickers. Nine different helmet designs? Seems a little too much. Won't be happening. White will be the helmet color for all games. thanks for posting nwh. good use of $. If these are safest helmets out there we wanted to provide as many as we could to those who wanted them. Some players will continue to use the model they have and prefer. However, most (if not all) players who want to use this new helmet should have access to do so. It would be pretty hard for a coach to tell a player "sorry, we're out of those helmets that have been tested to be the safest so take this one instead". Last edited by NWHoops; 11-11-2018 at 08:00 AM. I totally agree. Good call by Coach Wright and the booster club. Hope the other conference teams follow suit. Great move by the NW boosters. Yep good move by those at Northwest. With the one white shell can still do alot with different decals, facemasks etc. When it comes to new uniform pieces who do you all think will possibly make the move this year with a whole new set? I can not quite remember when FHSU got their normal Russell set but interested to see if they go full time to the antracite set from last year, maybe a road variant? Aren't RMAC wins only worth half wins?